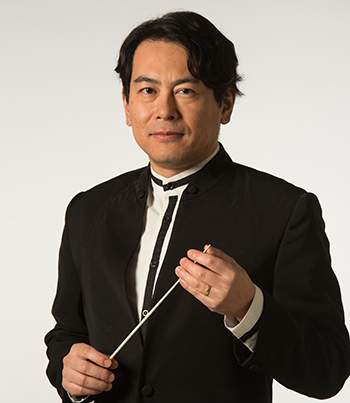 The 2017-2018 season marked Morihiko Nakahara’s first season as Assistant Professor and Director of Orchestral Studies at University of Massachusetts Amherst. It also signifies a dual milestone for Nakahara: the 10th anniversary season as Music Director of the South Carolina Philharmonic, and the 15th season as Resident Conductor of the Spokane Symphony Orchestra. Known for his charismatic presence on and off the podium, innovative and audience-friendly programming skills, and thoughtful interpretations of both standard and contemporary repertoire, Nakahara was featured in the League of American Orchestra’s prestigious Bruno Walter National Conductor Preview in March 2005. As a guest conductor, Nakahara will conduct the Stockton Symphony and the Spartanburg Philharmonic this season. Additional recent guest conducting engagements include appearances with the Buffalo Philharmonic, symphonies of Oregon, Jacksonville, Charleston, Chattanooga, Lansing, Peoria, and Green Bay, as well as with the Chicago Pro Musica. Recipient of the David Effron Conducting Fellowship at the Chautauqua Institution in 1999, he recently returned to guest conduct the Music School Festival Orchestra there. Equally at home in a wide variety of musical styles and concert formats, Nakahara has collaborated with Chris Botti, Béla Fleck & the Flecktones, Edgar Meyer, Brandi Carlile, Pink Martini, Sergio Mendes, and Roby Lakatos to name a few. A tireless champion for the music of our times, Nakahara recently led world premieres of works by Joan Tower, Dan Visconti, and John Fitz Rogers, and has led numerous U.S. premieres of works by Japanese composers. A passionate believer in audience development and music education for all, Nakahara is a popular clinician, guest conductor, and lecturer at various educational institutions. As a personable ambassador for classical music, he is regularly featured on local media outlets, and speaks about wide ranging topics including arts advocacy, leadership and management, and economic development at local businesses and service organizations. A native of Kagoshima, Japan, Nakahara holds degrees from Andrews University (BMus in Music Education) and the University of Cincinnati College-Conservatory of Music (MMus in Wind Conducting). He previously served as Associate Conductor of the Jacksonville Symphony Orchestra, Music Director of the Holland Symphony Orchestra (Michigan), and served on the faculty at Eastern Washington University and Andrews University.